The new Canon EOS 70D offers the best all-round combination yet of viewfinder, live view and movie shooting experience for a DSLR camera, backed up by excellent image quality from the 20 megapixel APS-C sensor, proven handling and fast performance, making it a very appealing do-it-all interchangeable lens camera that suits a lot of users. With its innovative Dual-Pixel CMOS AF system, the EOS 70D is the best "traditional" DSLR camera in terms of auto-focusing during Live View and movie shooting - we'd expect to see this feature quickly incorporated across the EOS range. It still doesn't quite rival the Sony SLT range or many compact system cameras for out and out speed, though, but Canon's new invention has definitely raised its game in what has always been something of a thorn in the DSLRs' side. You may think that bumping the megapixel count to 20 on such a comparatively small sensor would only degrade the resulting photos, but thankfully you'd be wrong. The 20 megapixel CMOS sensor and expanded ISO range produce virtually no visible noise at all from ISO 100 all the way up to ISO 1600, with even the three faster settings of 3200-12800 producing perfectly usable images (although 25600 is best reserved for emergency use). All other image quality aspects are up to Canon's usual high standards, so top marks go to the 70D in this department. Even the 18-135mm kit lens is worth considering if you've not yet bought into the Canon system. 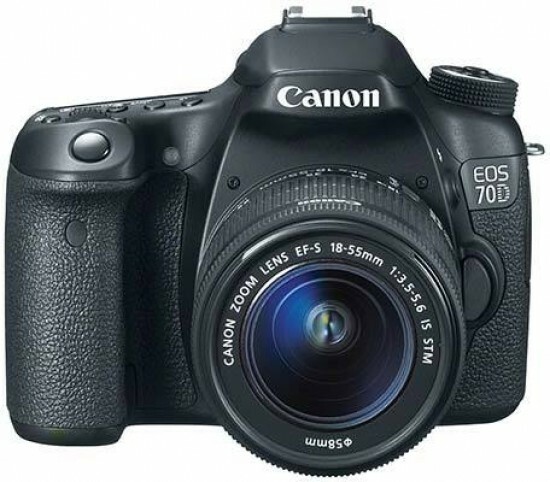 The 70D shares many of the features offered by its little brother, the Canon EOS 700D / Rebel T5i - a 3 inch 1040k-dot LCD screen with 3:2 aspect ratio, 63-zone metering, Full HD movie recording with user selectable frame rates, and similar build quality. We'd still recommend paying the extra cash, though, principally for the 70D's better viewfinder, 19-point AF system, secondary LCD screen and control dial, speedier burst shooting, more refined movie mode, wi-fi connectivity and much more intuitive control layout and handling, not even mentioning that compelling Dual-Pixel CMOS AF system. And it inherits so many key features from the higher-end, but older, 7D model that for us the cheaper 70D is a more sensible purchase. Indeed, until we see Dual-Pixel CMOS AF inevitably make its way across the EOS range, we'd recommend the new Canon EOS 70D as the APS-C camera to go for if you're currently considering a mid-range DSLR camera. It offers a winning blend of features, performance and image quality that is hard to beat, both by its EOS brothers and other manufacturers' offerings. The new EOS 70D marks a real step forward for both Canon and the venerable SLR camera.